Today, I’m sharing a sneak peak of one of the Halloween sets that will be available in the Holiday Catalog. I know it might seem a little early for Halloween cards and treats, with school just starting. But with the whirlwind of back to school activities, I’m dreaming of some cooler Fall temperatures. I thought it would be fun to jump into the next Holiday. I love that there is a coordinating punch with the Cookie Cutter Halloween stamp set. I love when I don’t have to hand cut images out. That makes projects so much quicker! And bonus, there is a second coordinating stamp set for this punch – a Christmas stamp set. 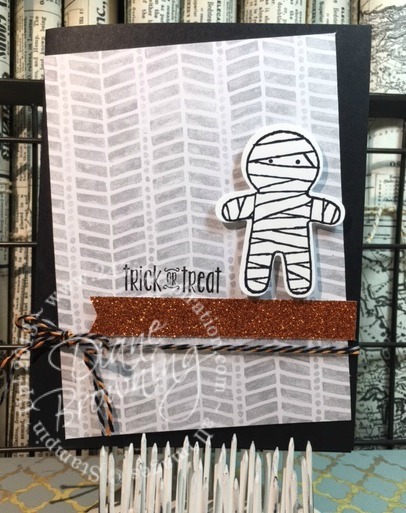 To make this card quick and easy, I used the mummy, which needed no watercoloring. And a simple background paper from the new Halloween collection. And do you see that sparkly Pumpkin Pie Glitter paper? Oh My! It is to die for. I also used a bit of the Halloween Bakers Twine which comes in a two-pack. Super cute and super quick! Just what’s needed with all the flurry of activities.